Prepare the loose-leaf chai-spiced black tea the same way you would a loose-leaf breakfast tea or earl grey or any other black tea. Add to the tea leaves. Steep 3-5 minutes (usually with chai-spiced tea, you want to do the full 5 minutes). Steep the leaves loose in the water and strain the leaves when pouring the tea into your cup or a warmed teapot. Slowly heat 1 cup of water and 1 cup of milk in a saucepan just to boiling. Don’t let the milk get to a rolling boil. Remove from the heat. Add 1 level Tablespoon (or 9-10 grams if you’re using scales) chai-spiced tea to the prepared water/milk combination. Add the tea loose & use a strainer when done steeping, or hold the tea in a natural tea brew filter (available at www.kteasonline.com) and put the filter in the water/milk combination. Allow to steep for 4-5 minutes. If you prefer sweetened tea and you are using a strainer, add granulated sugar to the tea before you strain the tea. It helps keep the smaller pieces of tea from getting into cup or teapot that you’re pouring into, and it nicely sweetens the beverage. 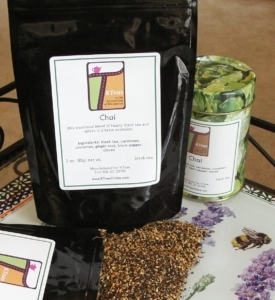 For more chai recipes and other information, please visit KTeas of Fort Mill’s website, www.kteasonline.com.